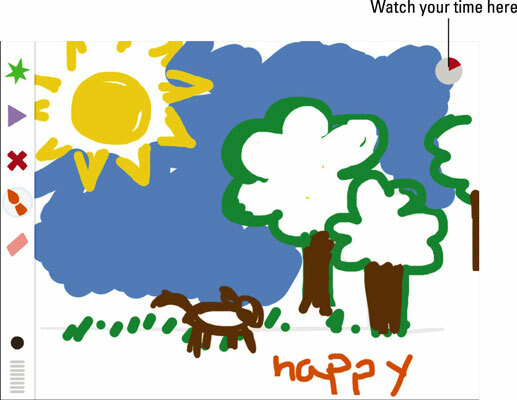 Doodlecast for Kids iPad app turns the typical child’s drawing into a narrated video. With Doodlecast for Kids, students can tell the story of their artwork as they draw it on the iPad. Young students improve their language skills and storytelling ability, and learn how to express themselves better through art. Doodlecast for Kids iPad app is easy to use; just draw and talk at the same time. Tap the Play button when you’re done, sit back, and watch and listen as the drawing unfolds in front of you. Kids love watching, and parents or teachers can save the movies and share them. Doodlecast for Kids is a fun and creative activity. It’s also a compelling educational tool. It can be a useful method for children to practice their letters, spelling, and numbers, or even to get children to discuss their feelings. Doodlecast can help children explore their imagination by telling stories while drawing elements of them . . . or, alternatively, practice their drawing skills while explaining the illustration. 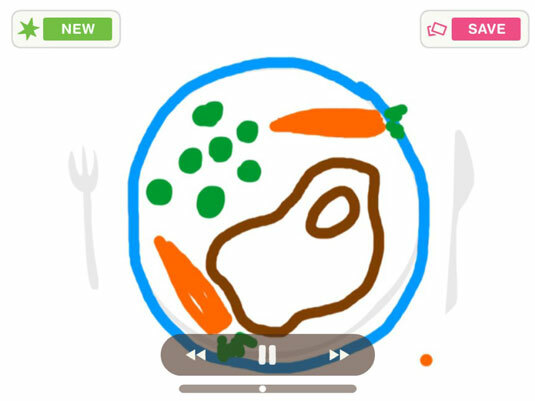 The Doodlecast for Kids interface is simple and easy to navigate. It comes with more than 20 drawing prompts, which are simple questions designed to give children a starting point in creating a story. It could be a topic like “clothing” or an adjective such as “messy.” Budding artists take their inspiration from there. These prerecorded prompts are played at the beginning of the video. To begin creating your own Doodlecast, tap the Start prompt on the opening screen. Select a theme from 12 drawing templates that contain an object or location. Your choices include a sky, park, or boots (among others), or select among 12 word bubbles that contain adjectives, such as loud, happy, or stinky. Depending on the theme you chose, the app then asks you a question such as “Who is wearing the boots?” or “What tastes yucky?” You can also elect to skip the themes and start with a blank page. Select the Brush tool to start your drawing. A brush menu appears with nine color options and three brush sizes. Tap your selection and start your Doodlecast. The recording will start automatically when you enter the following screen. While you’re drawing, the app records the audio. You have up to three minutes, and a time meter at the top of the screen keeps track of the time remaining. You can pause the recording at any point by tapping the large dot on the lower left of the display. Tap the Record button, and tap Pause. The button will change from red to black. To resume, tap the button again. Use the break to change or clear your drawing or to collect your thoughts. When you’re finished, tap the triangular Play arrow, and tap Done on the pop-out menu. Doodlecast prepares your movie, and you can tap the Play arrow to see your completed movie. You can also tap Save to export the video to the camera roll or upload it to YouTube if you have an account.